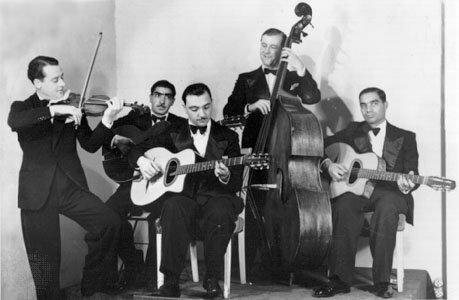 I came across this video of the Rosenberg Trio and was quickly reminded of my fascination for gypsy jazz guitar aka jazz manouche. The most well known hero of this style is Django Reinhardt. As a young adult, I was first introduced to this infectious style of gypsy jazz playing by listening to mandolin master, David Grisman. David collaborated with violin virtuoso, Stephane Grappelli, on a couple of his albums, and it was love at first listen for me. Grappelli then lead me to Reinhardt. Both men were founding members of the Quintette du Hot Club de France, one of the first all-string jazz bands in Paris, France. As seen in this video, Django magically moves about the fretboard of his guitar with only the use of two fingers of his left hand, a handicap which was a result of his caravan catching on fire and Django succumbing to major burns on his hands and body.